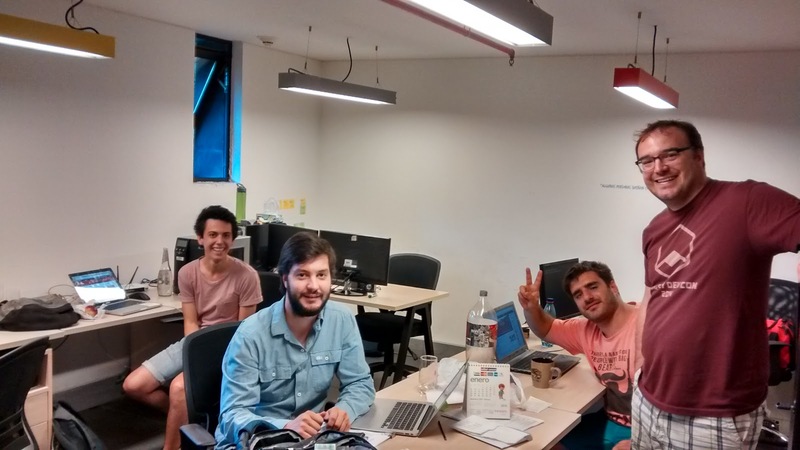 Documenting my experiences participating in Startup Chile. 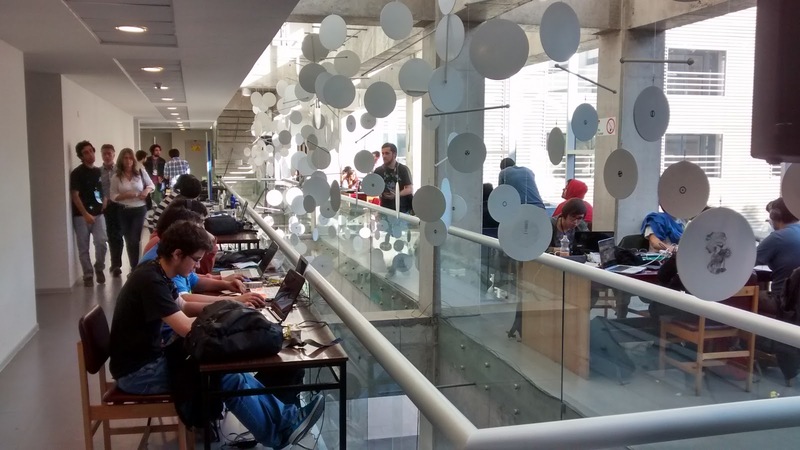 Will and I traveled to Concepcion, Chile this weekend to be mentors at "Hackathon del Fin del Mundo" (Hackathon of the End of the World, a reference to Chile's position as one of the southernmost countries in the world). 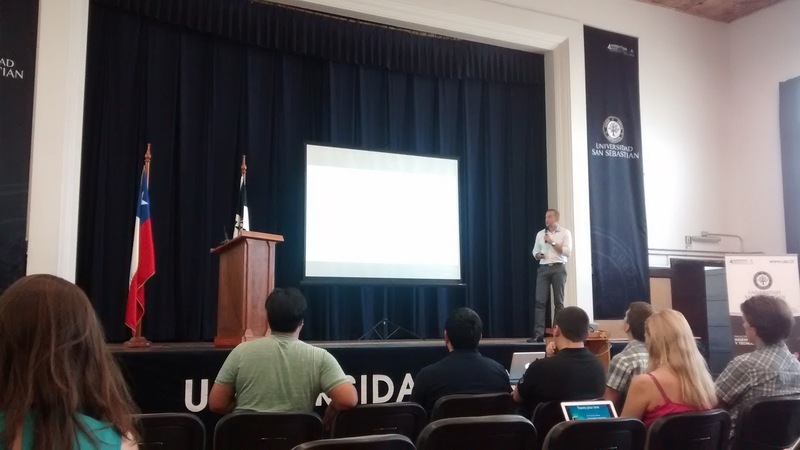 The event was held at the University of Concepcion, one of the largest universities in Chile. UdeC as it is called is somewhat unique in that it is entirely located on an American-style campus. 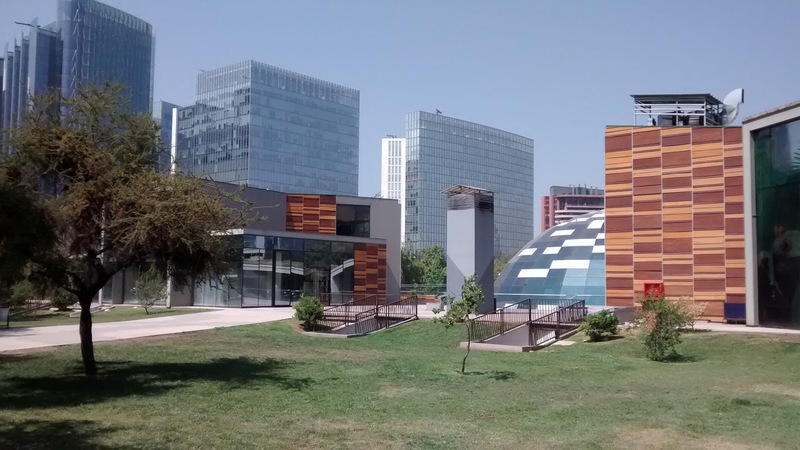 Most Chilean universities are spread out over several campuses or simply occupy ordinary buildings within a city like many urban schools in the US. The hackathon was a lot of fun. It attracted some very talented designers, developers, and "hustlers" (as the business types are called) from the southern regions of Chile. 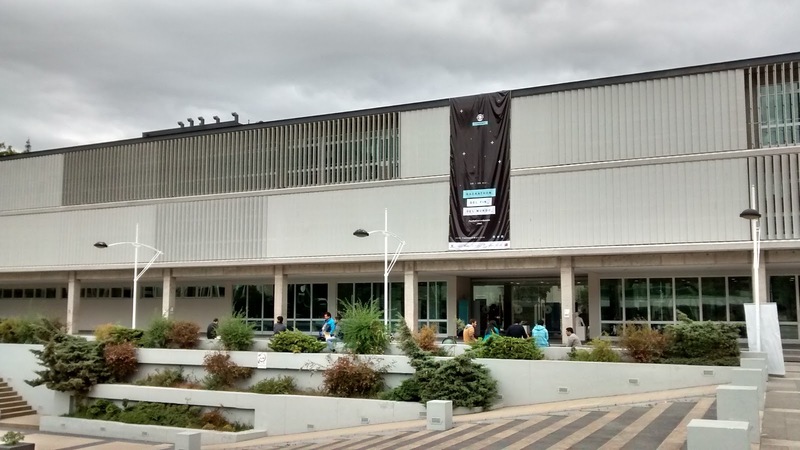 I believe there were around 150-200 participants, which is quite impressive, especially since the south of Chile is rather sparsely populated. Projects ranged from NFC-enabled restaurant menus to drones for surveying wildfires. I am probably not a great "mentor" because I'm not very good at starting conversations with strangers. This weekend was particularly tricky since many of the participants spoke only basic English and my Spanish is pretty minimal still. However, I got to talk with several teams about their projects. I worked quite a bit with one team in particular. They were working on an app to identify birds by their songs. They had already done their research (literally, their approach was based on a peer-reviewed journal article) and had a talented programmer with plenty of experience in machine learning. We discussed their methods and I gave some pointers on how they might present their prototype to the judges to get a better response. I also got to show off my "mastery" of Vim (although I'm an Emacs user now). They ended up getting second-place overall, so it was a very happy outcome! Concepcion is a nice city. 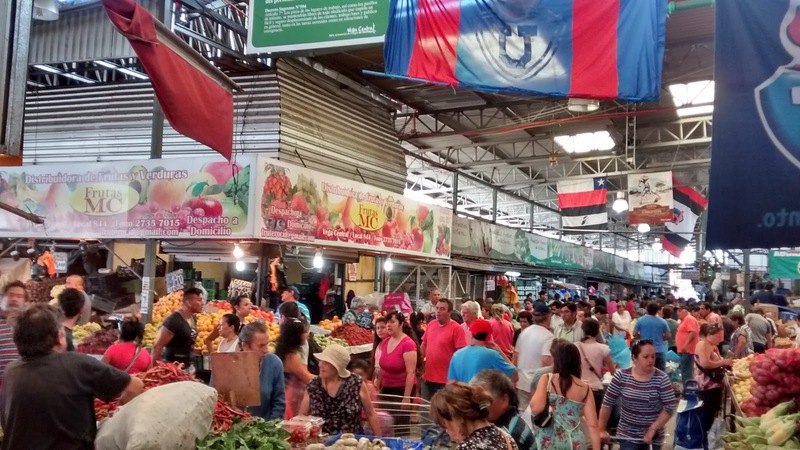 It is definitely very urban, though it is only about one million people, but it is further south so the weather is better than in Santiago and the air is much, much cleaner. I've included some pictures below. The photo above is interesting. 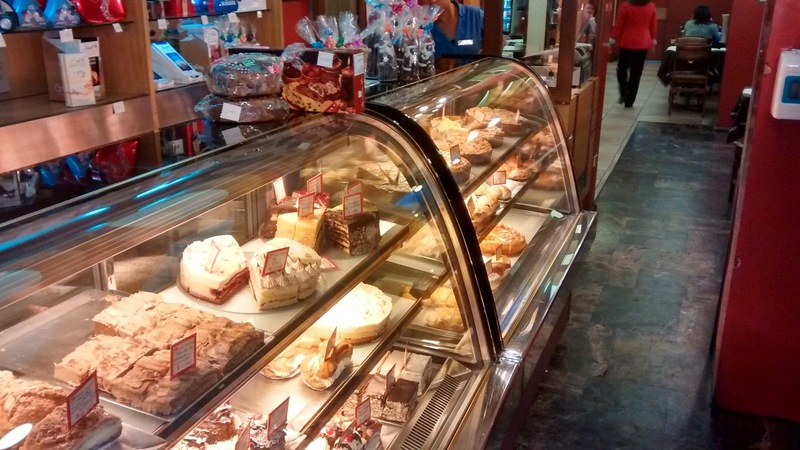 Concepcion suffers from quite a few destructive earthquakes. The most recent major quake, in 2010, killed several hundred people and triggered a fire that burned down part of the Chemistry building at UdeC (which is where the event was held). 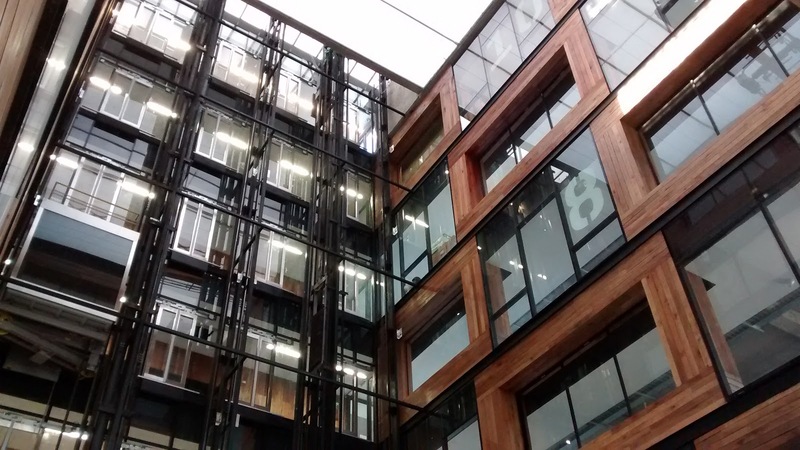 This is one of the points where the newly re-constructed part of the building meets the older part. 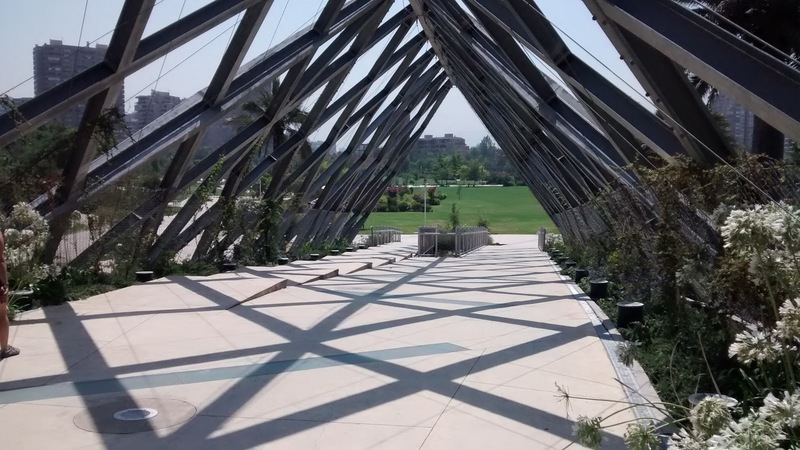 Instead of being rigidly attached, the buildings are connected by flexible rubber joints so that the two parts of the building can move independently in the event of a quake. 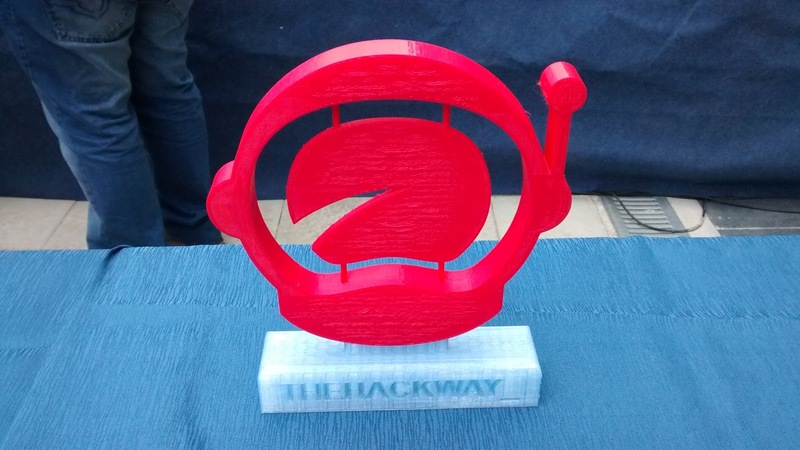 This was the second-place trophy, it was 3D printed during the day on Saturday by one of the sponsors of the event. Chile is famous for its murals. 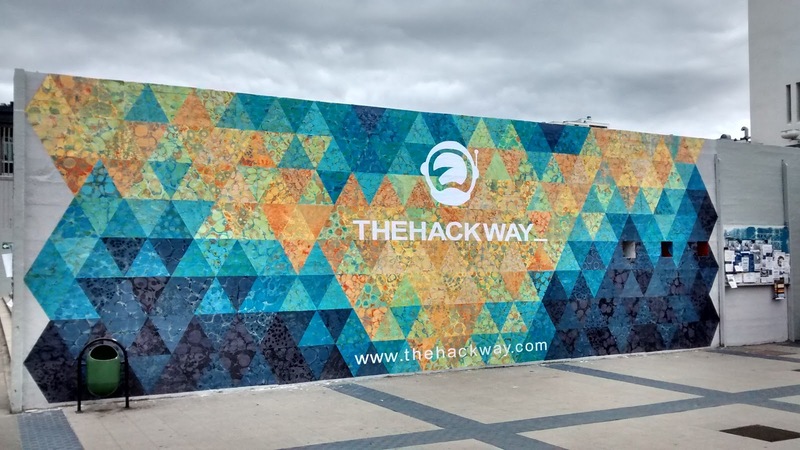 The event organizers commissioned a temporary mural on campus to promote the hackathon, it turned out really nicely! 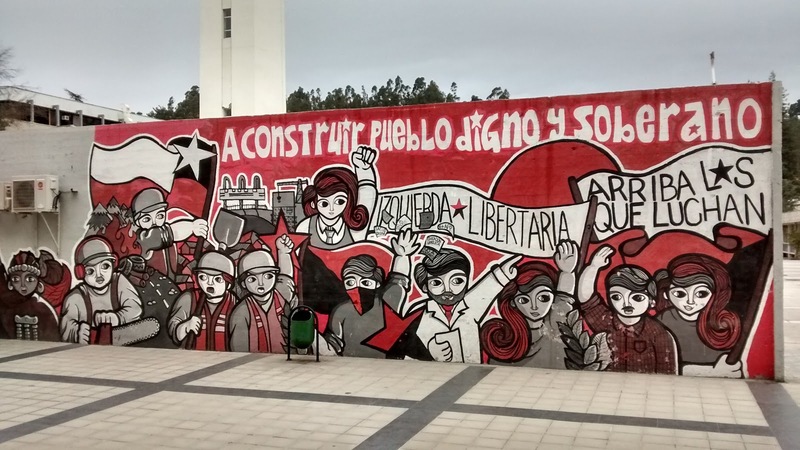 A leftist political mural. Concepcion appears to be a bit of a hotbed for leftist political activism in Chile, there were quite a few posters, murals, and "tags" offering similar sentiments. Note that Monsanto (the agriculture company) gets a mention. I approve. 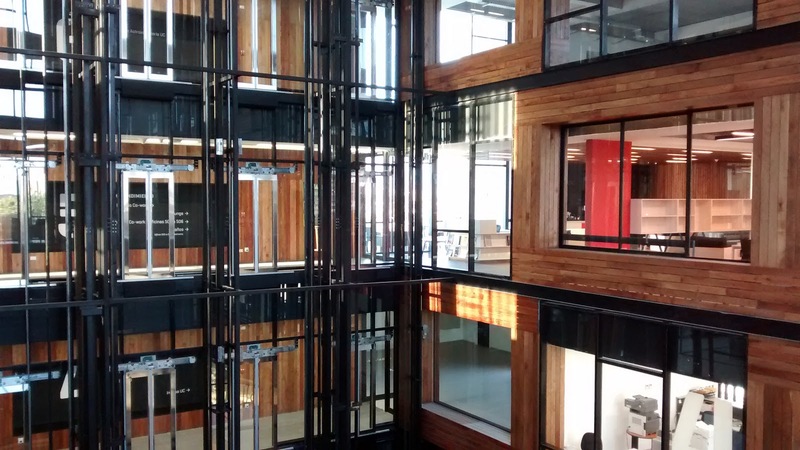 Two shots of the chemistry building at UdeC, where the hackathon was held. A nice shot of the main quad at UdeC. There was a lot of soccer going on, as one might expect! Participants working on their projects! 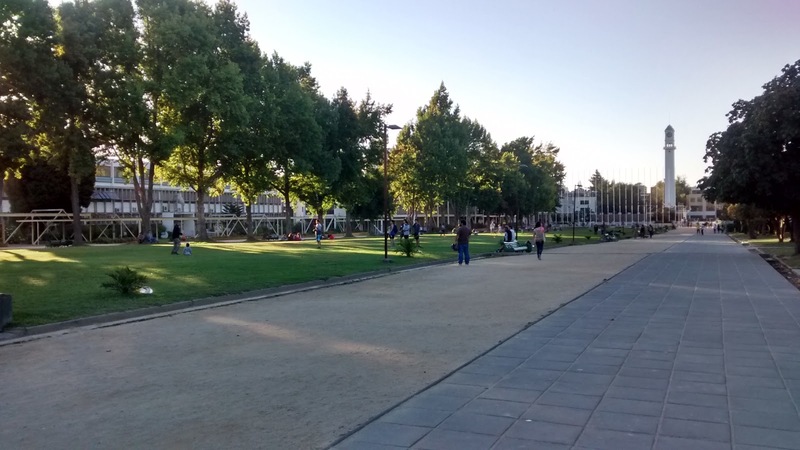 This is Plaza de Armas, the main square in Concepcion. 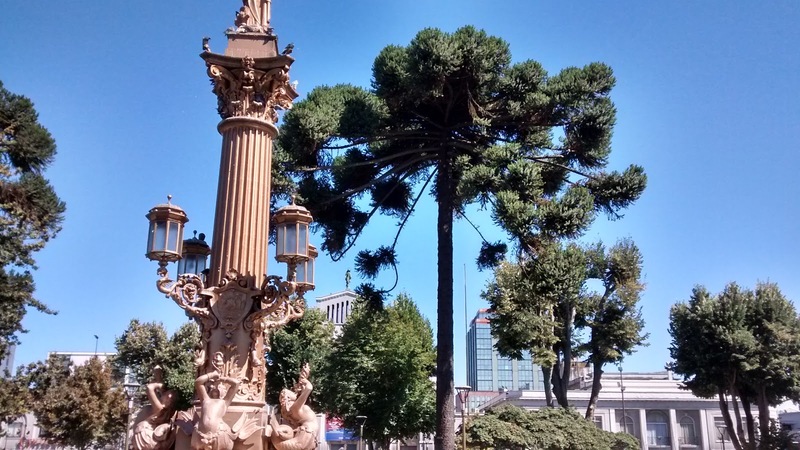 Those weird pine trees are all over the place in southern Chile. I like them. 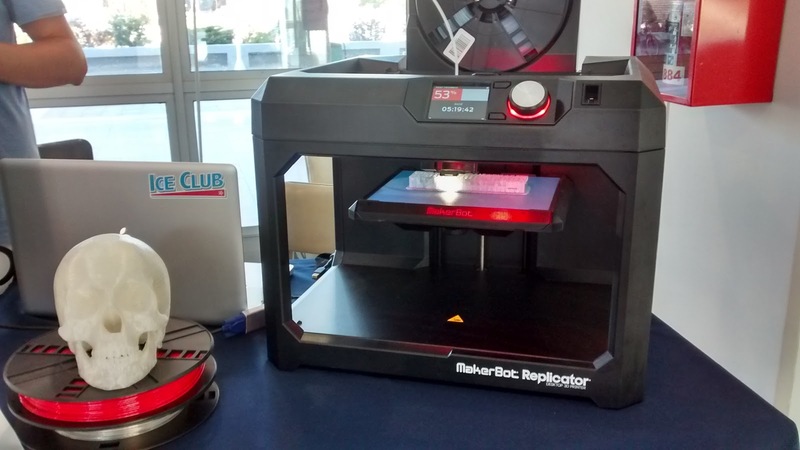 As previously mentioned, one of the sponsors of the event is a 3D printing company. They brought some samples. You can see the trophy pictured above being printed. 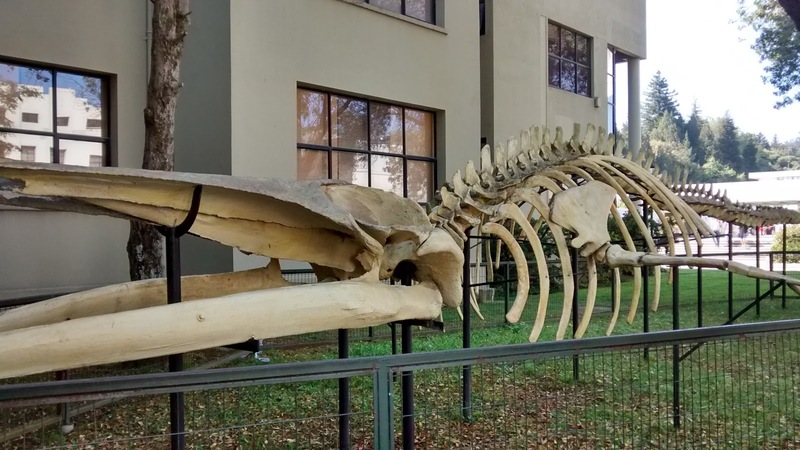 A whale skeleton. Random. I like it. 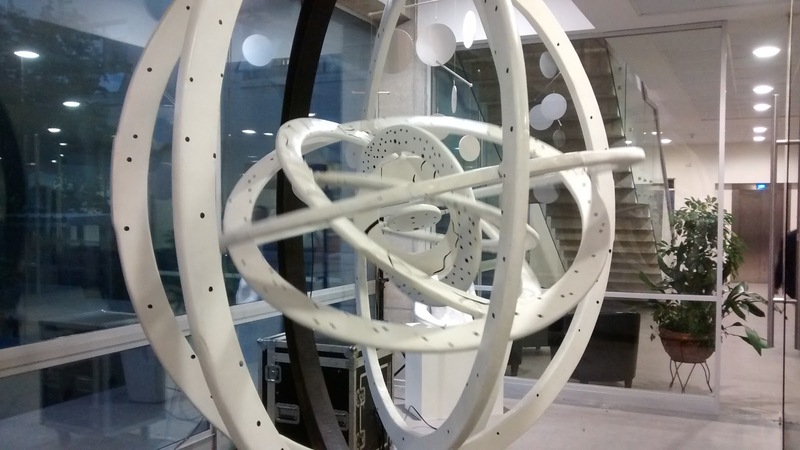 This piece was in the entrance to the chemistry building. The circles actually moved, it was pretty neat. 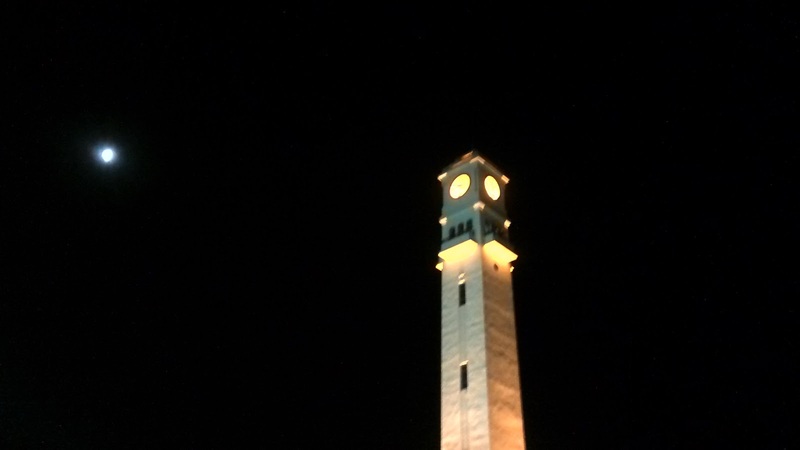 The clock tower at UdeC at night with the moon in the background. 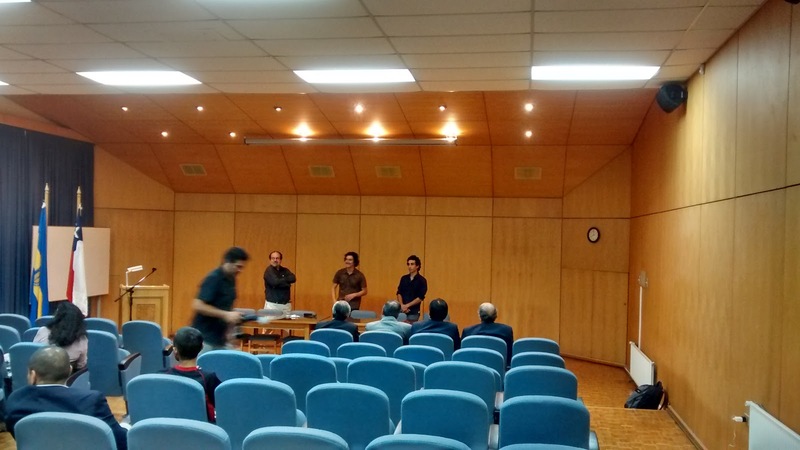 And finally, the hackathon organizers, Pablo and Diego welcoming the volunteers and event staff. First, as you already know if you read Jen's blog, we visited the lakes district a couple weeks ago. I didn't take many pictures because I didn't carry my phone very often, but I did take a few. 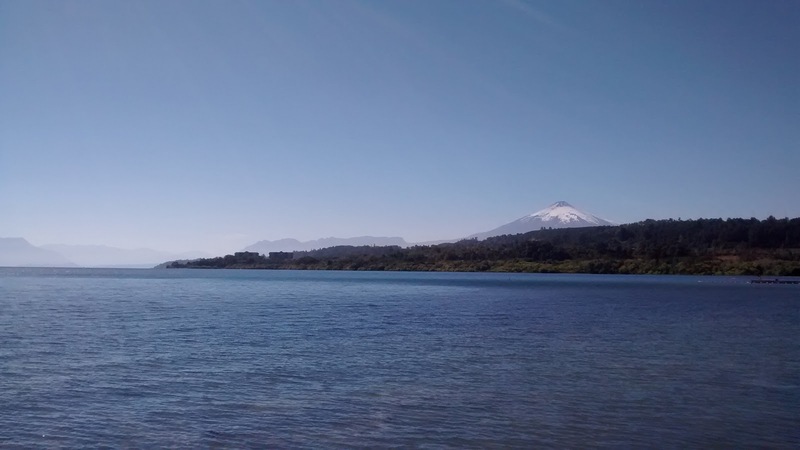 Below you can see Villarrica, the volcano that erupted last week. 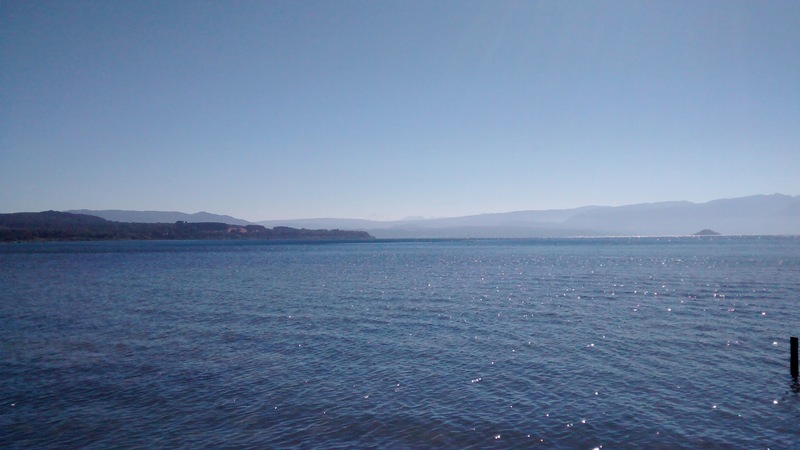 The first two photos were taken on the lake in Villarrica (the town). 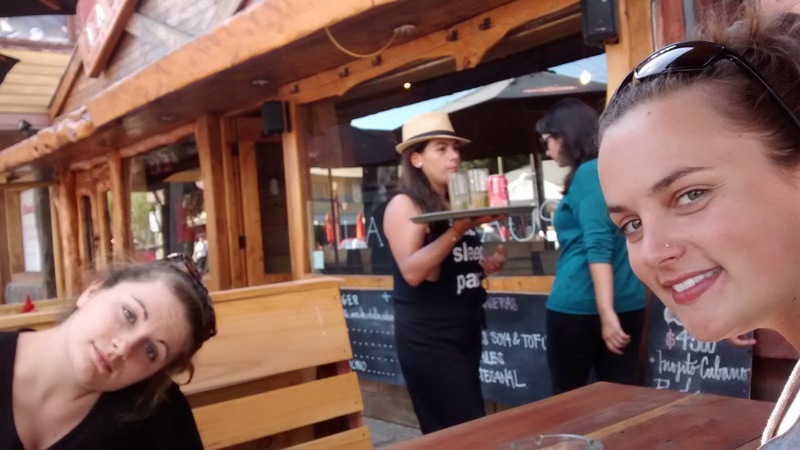 The second two were taken at a burger place we went to in Pucon, another town near Villarrica. On the left is Missy, Jen's sister, who was visiting for a couple weeks on her way back to the US from living in South Korea for a year. It was quite an adventurous year for her. 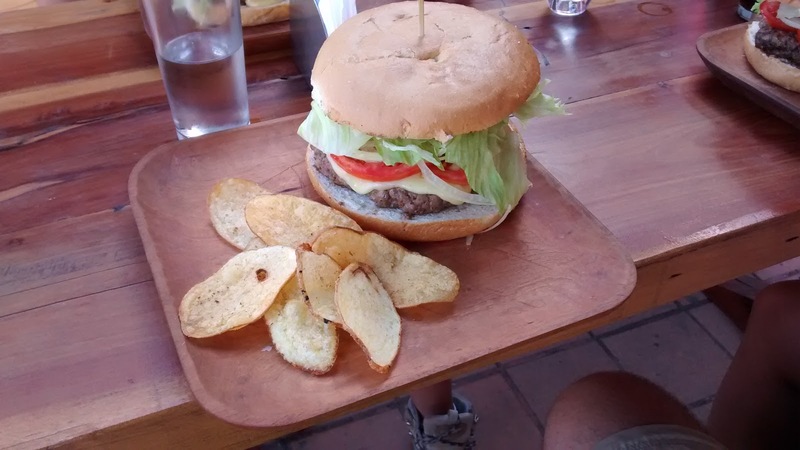 For whatever reason, burgers in Chile are massive, though not usually very flavorful. The one we had in Pucon was quite good, but most of the time they are slathered in mayo and a massive amount of Guacamole. 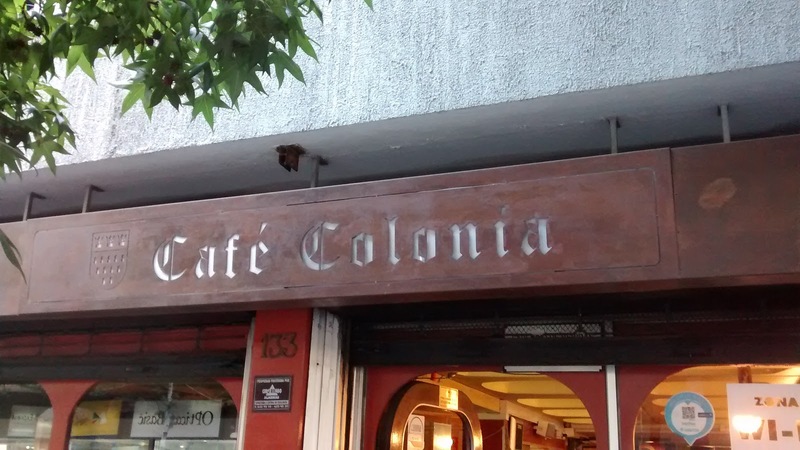 In general, the food in Chile is pretty forgettable, but then we haven't eaten at any "upscale" restaurants, so maybe those are better, I don't know. 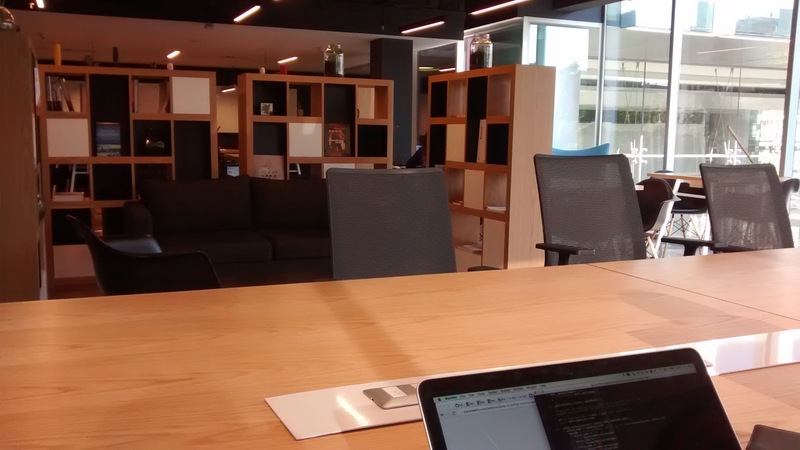 In Startup Chile news, we had "pitch day", which was actually two days and incredibly boring (I just don't like sitting still, it's a character flaw). 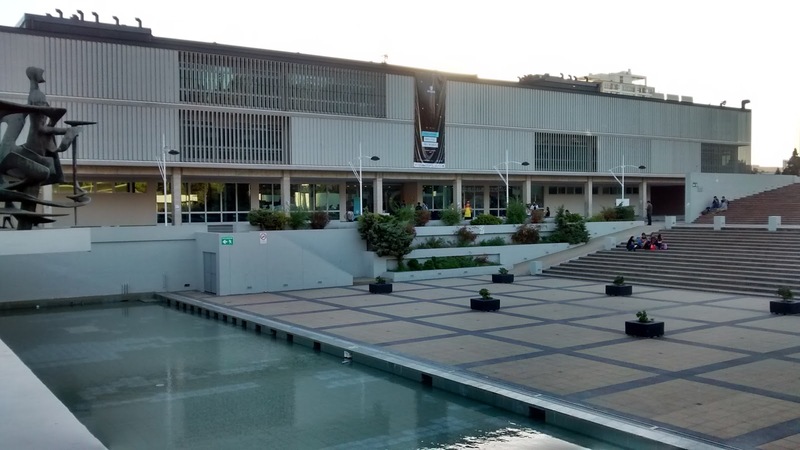 We didn't get chosen to compete to "win" Startup Chile, but that's OK, we didn't really expect to since we are pre-revenue. A couple of the companies were pretty interesting. One, Keteka, is especially cool. They partner with local guides and tour operators to provide authentic travel experiences, and income for people in areas that are off the beaten path. Jen actually booked her upcoming trip to Patagonia through them. As mentioned above, Jen will be leaving for Patagonia, along with Will, and Will's dad and uncle. 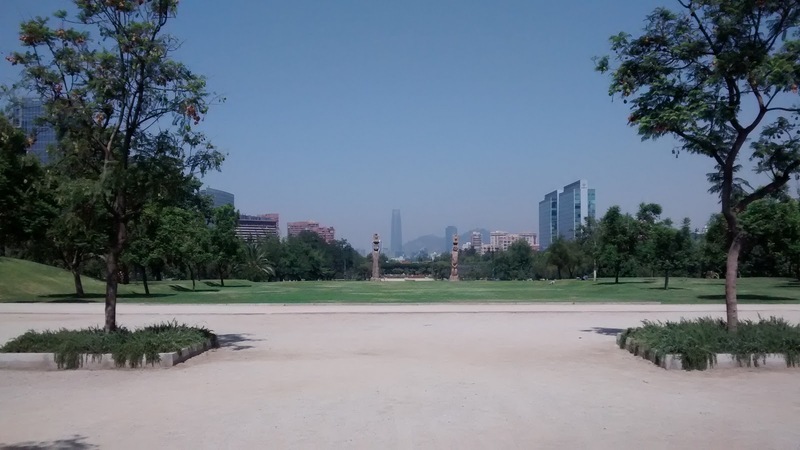 I am staying Santiago to hand in our Startup Chile paperwork, because if there is one thing more closely associated in my mind with Chile than Patagonia, it is massive amounts of pointless, soul-sucking, mind-numbing paperwork. I haven't written a post in awhile. This is partially because I haven't had much interesting to say, and partly because I've been working a lot. Actually, those two are one in the same, but that's fine. Now I have some interesting things to say and some time to say them. Last weekend, Jen and I hiked up the big hill / small mountain near our apartment. It was quite a climb, but it was a nice walk. Basically the entire thing is a municipal park, so there are a lot of trails and things in addition to some roads. There are also some nice views of the city from up there, especially since the park itself is immediately bordered by a lower-density area with few tall buildings. 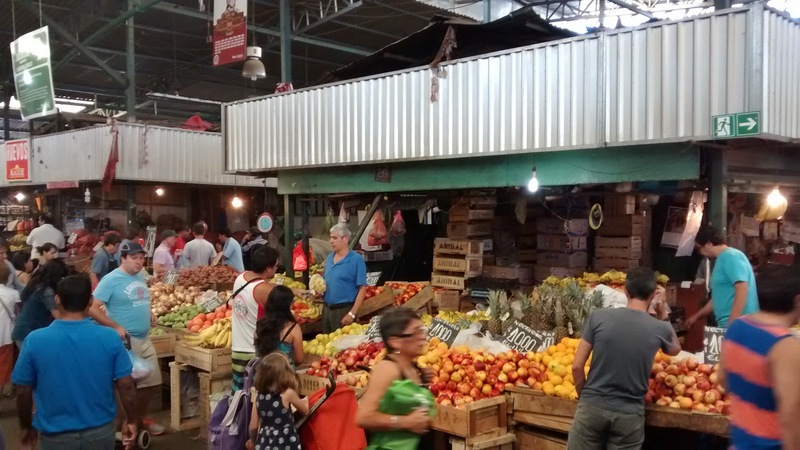 We also went to La Vega finally. 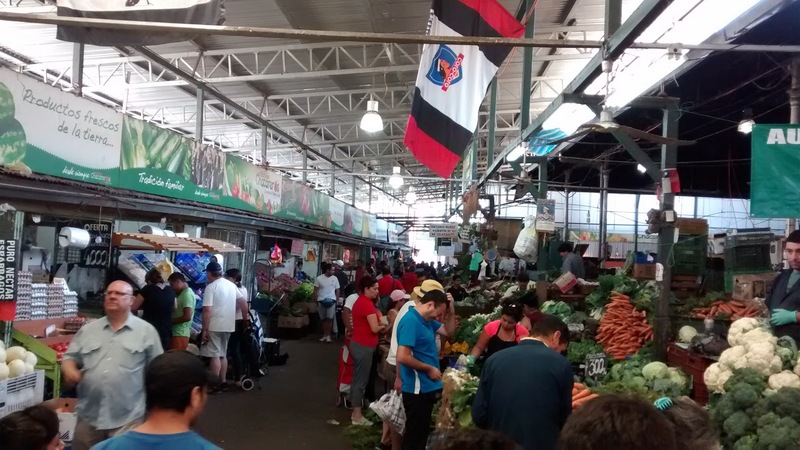 La Vega is a massive public market. 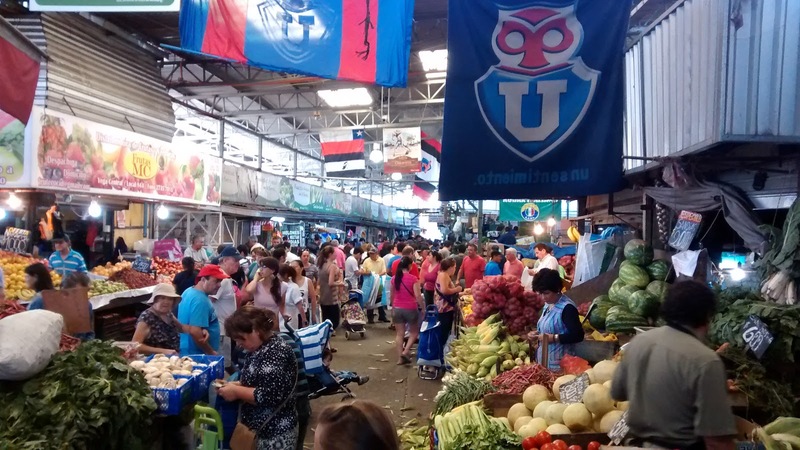 It resembles an enormous farmers market, but there is permanent infrastructure and such, so it isn't really the same thing. It was actually pretty intimidating because the pace is quite fast and it is really, really large. I tried to capture the chaos in a few pictures. Since we got here, Jen has taken up knitting. Her first project was a gift for her sister (who is currently on a plane en route to Chile, meaning the embargo on this information has expired). Her second project, however, was a gift for me. 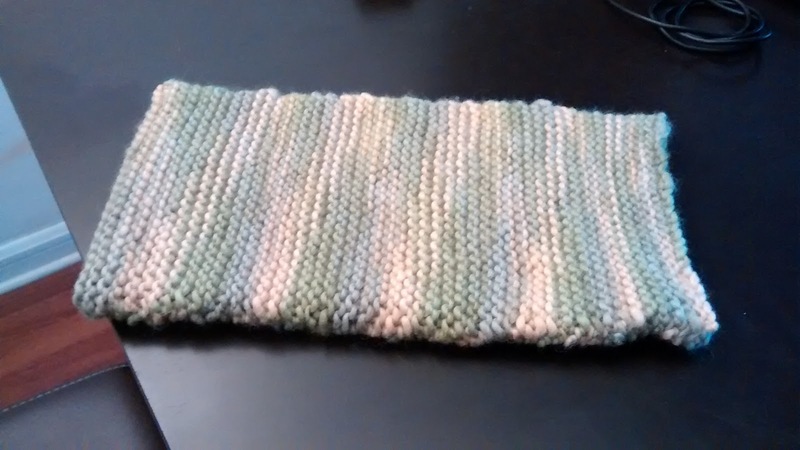 It is a laptop sweater! 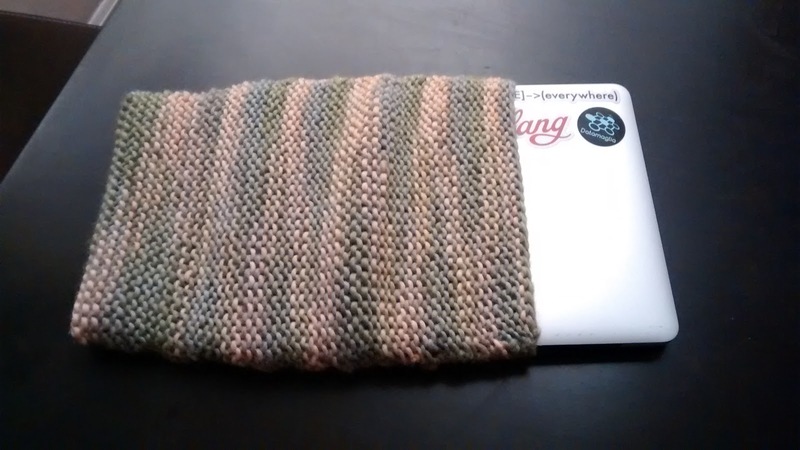 In other words, a knitted laptop protector. It is really incredible, she did a great job. It fits my laptop perfectly and is dense enough to offer good protection against bumps and such while I'm carrying the computer. I'm hoping to start a trend. 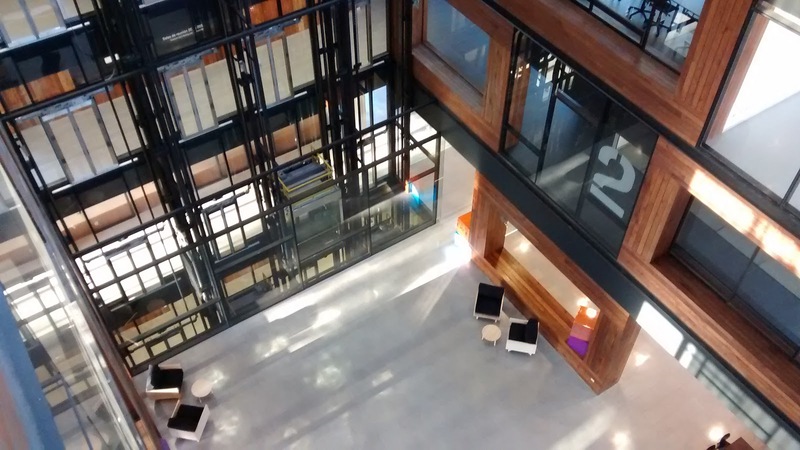 Finally, Will and I spent several days last week working on the fancy co-working space in San Joaquin. 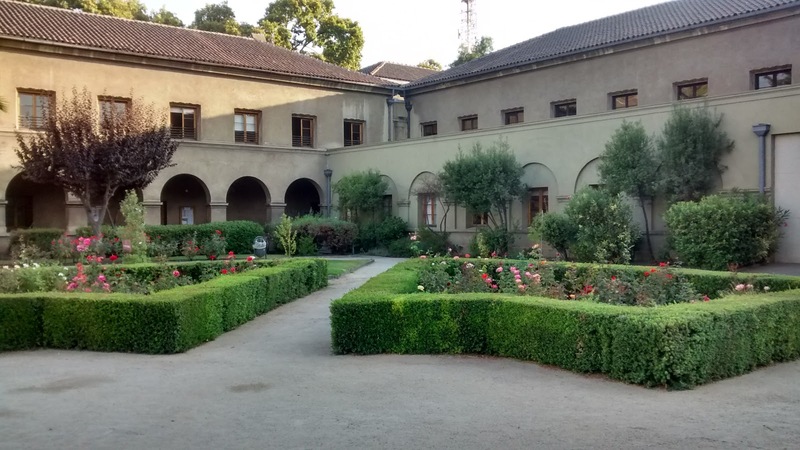 It is on the campus of one of the more prestigious universities in Latin America, Pontifical Universidad Catolica. 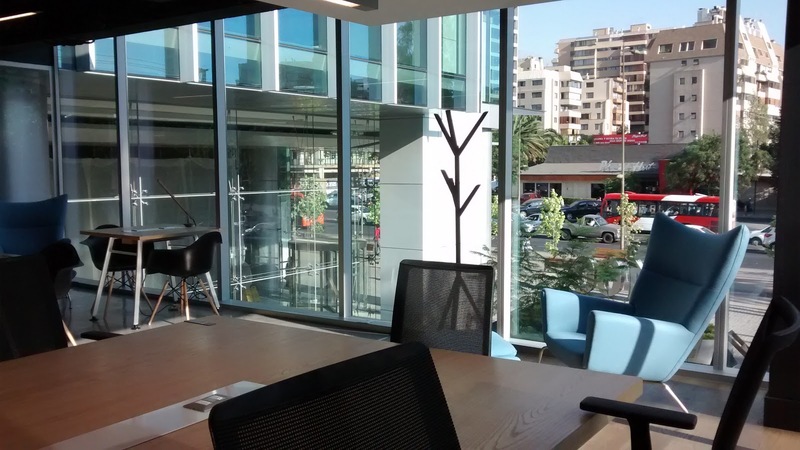 It is located in their new "Innovation Center", which is an incredible 10-story building with some extremely interesting architecture. I think I included a picture in a previous post, but I took a few more this past week. 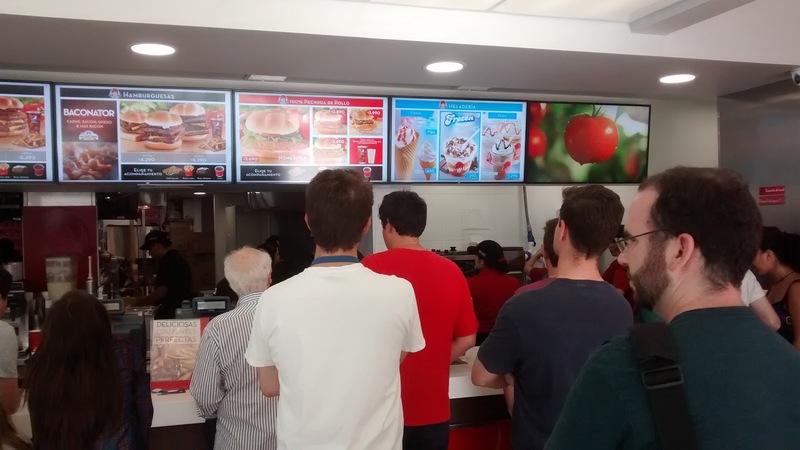 And finally, the reason for the title, Will and I tried the new Wendy's today! It was delightfully American. 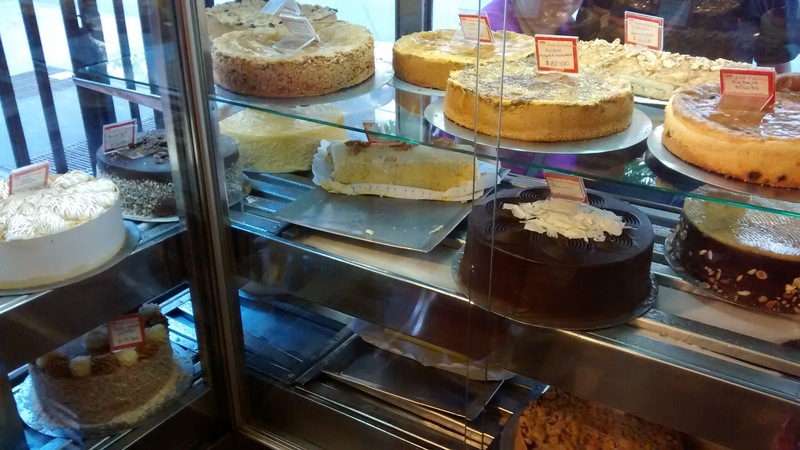 It was also quite busy despite having opened a couple weeks back. 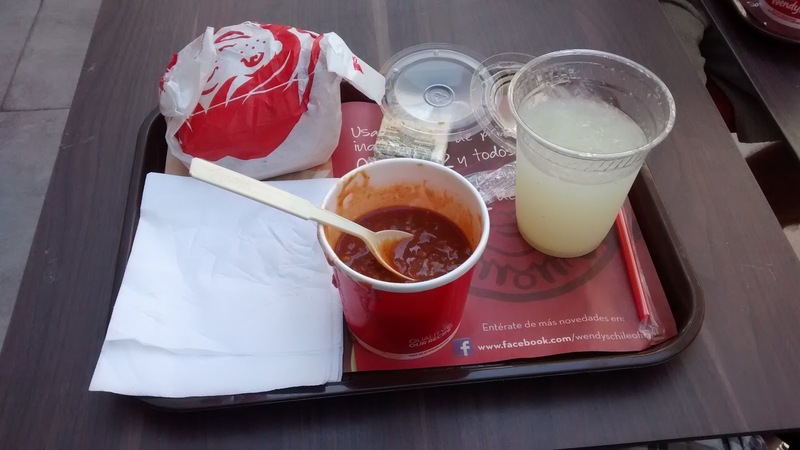 I had chili, it was very tasty. I had a couple new experiences in the last week. First, I tried Empanadas. They are similar to Hot Pockets, but much more authentic. I tried two different kinds, one with just cheese inside (and more of a flaky crust), and another, called Napolitana, with tomato, ham, and cheese. They were quite good, and they generally only cost about $1.50, which is a good price for a lunch. 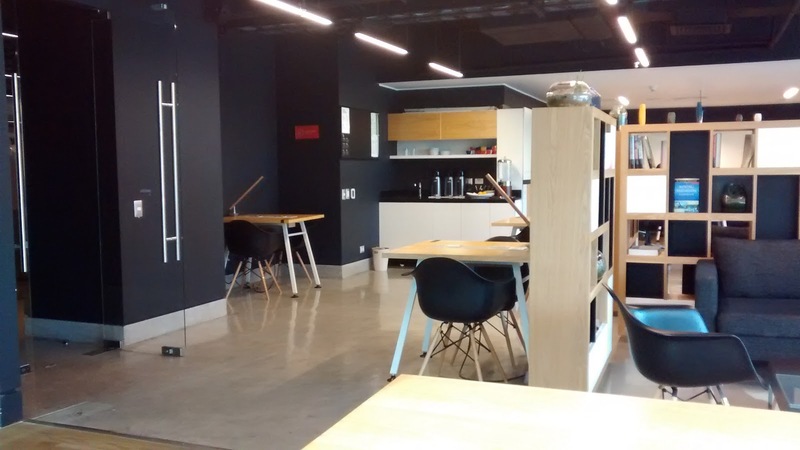 Last Wednesday we got a deal on day-passes for an high-end co-working space called JustPeople in Las Condes (a Santiago neighborhood, think Chicago's South Loop with more office buildings if that means anything to you). It was extremely nice. We are considering signing up for a membership, depending on how good a deal we can get. I've included some pictures below. Will and I visited the young entrepreneur we are "mentoring" (I put that in quotes because I suspect he would do just fine without our advice). He is kind of a meta-entrepreneur. He and his team have started an agency that basically acts as a technical team-for-hire, but instead of being paid in cash, they take significant equity in the companies they work with. It is a very interesting business model. He and his teammates are all delightful people and we are looking forward to hanging out with them again this coming week. During some random wanderings, I found some random things. 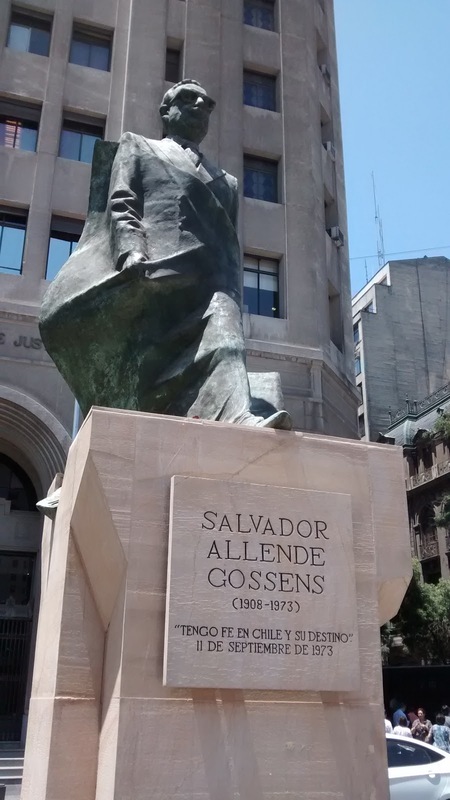 I got a picture of the (one of several, I would imagine) statue of Salvador Allende, whom the United States helped assassinate (because freedom, or something). I also found a statue of Abraham Lincoln that had been vandalized with the words "Operation Condor" (look it up), so there's that (no picture). 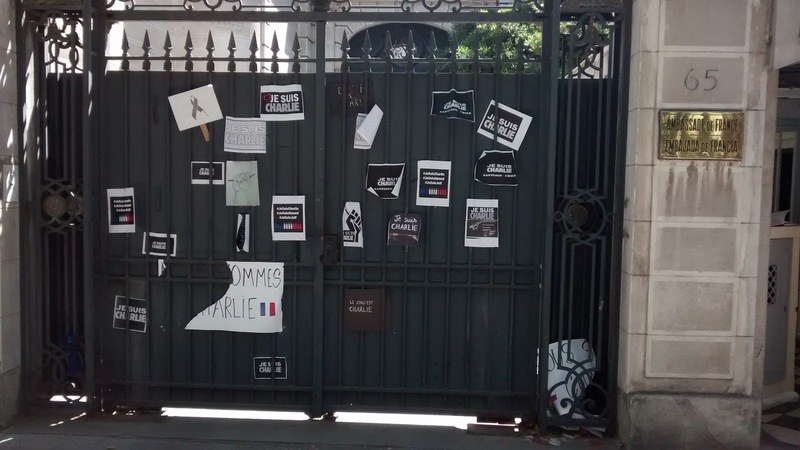 To round out the political part of this post, I walked past the French embassy the other day and got a quick photo of the notes people had left in the wake of the Charlie Hebdo shootings. 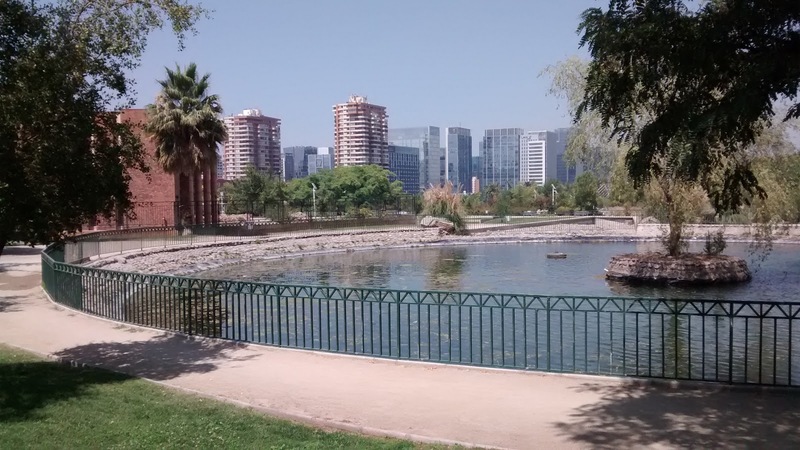 Finally, on Saturday Jen and I explored a very large park in Las Condes. 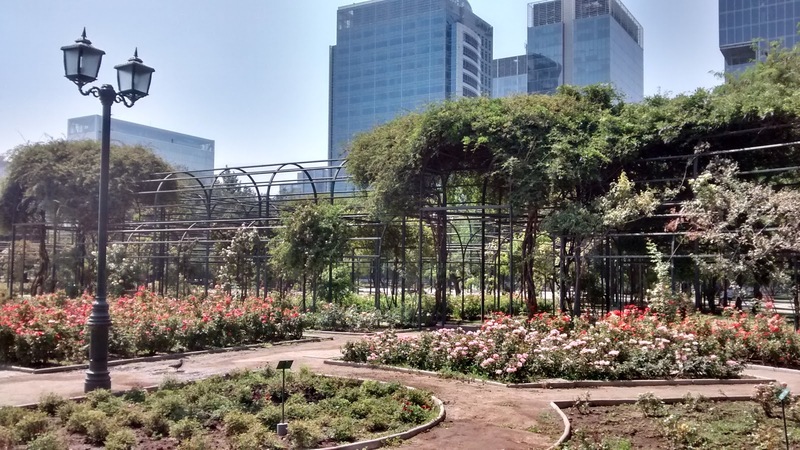 It had a beautiful rose garden and some very interesting architecture. It was quite hot that day, so we spent some time sitting in the shade near the roses, but we made sure to walk around the entire perimeter. We also found a small Thai garden at one end. The asian influence is interesting. I think because we are actually further east than the east coast of the US, it is easy to forget that we are actually on the west coast of South America. 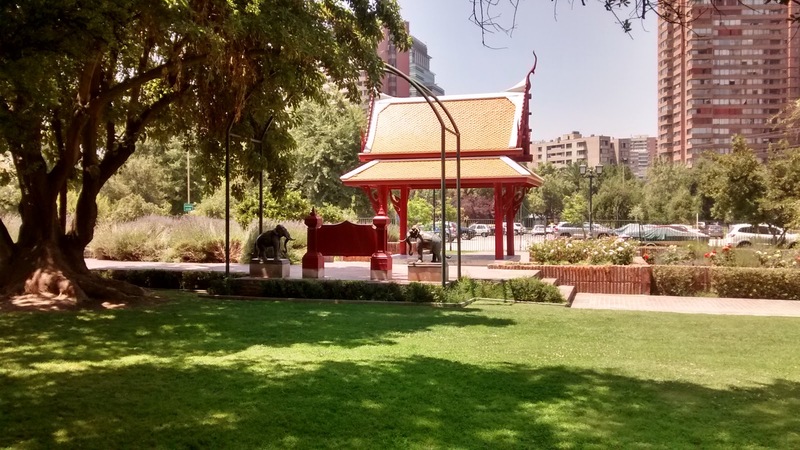 Two anecdotes from the park. 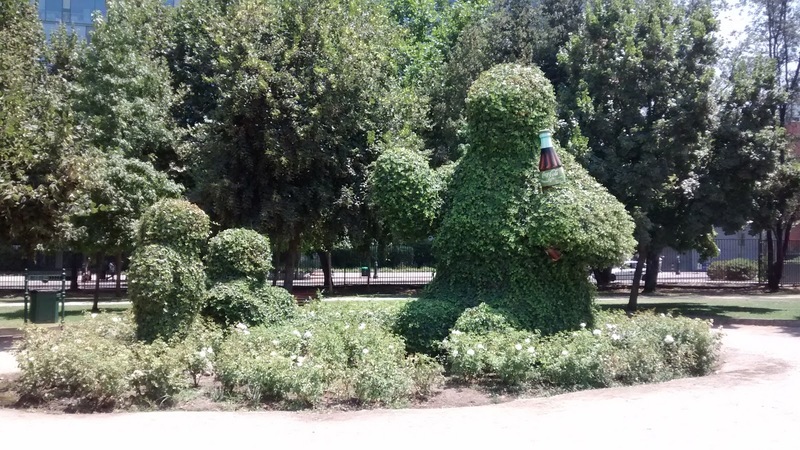 First, you'll notice two statues made of greenery. 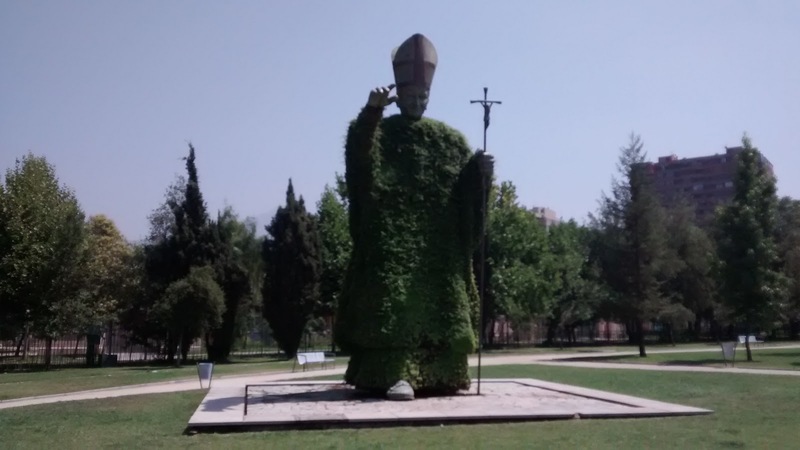 The second one is pretty clearly intended to be Pope John Paul II (who visited Chile, to much celebration, during his tenure). As Jen and I walked up to it (from the side) she mentioned that it was interesting. I responded that yes, it appeared to be the Pope. She said "Oh, I thought it was some kind of wizard!" Next, you can see that Jen made another canine friend this week. They seem drawn to her. Last week our friend left us when we started going up too many stairs. 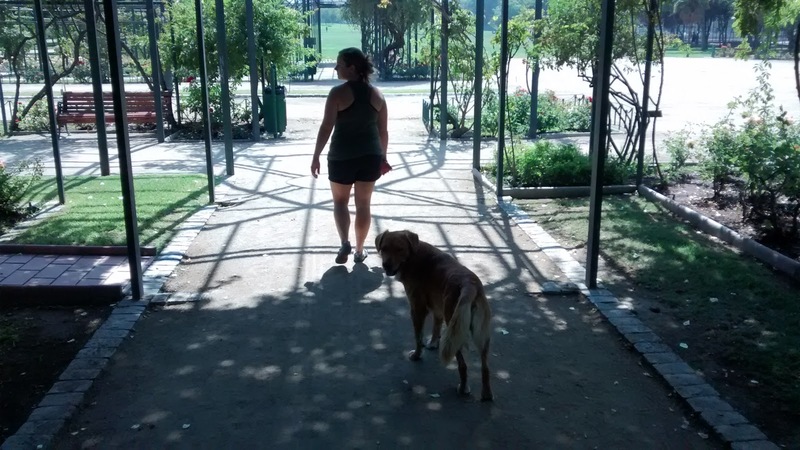 This week's dog appeared to loath the sun, so once we left the shady section of the park he stayed behind. Will and I have been working furiously this week to get to a point where we can start to demo the product to people. Today we worked all day, then came home and, as of about 11pm, are still at it. We took a break to go to our first Spanish lesson (Jen is taking them as well). It was pretty fun, and the teacher is very enthusiastic and friendly, which helps a lot. I kept having flashbacks to Spanish classes in school. If I ever have the misfortune of reproducing, I will enroll the child in language lessons very, very early. 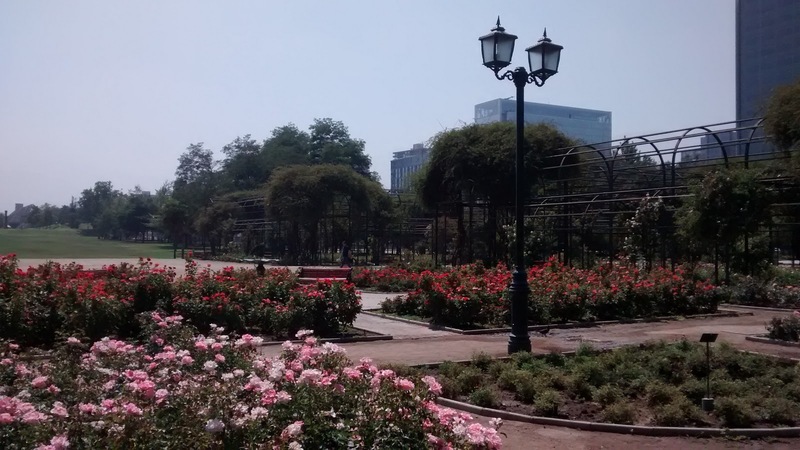 Last weekend Jen and I wandered around a couple very nice parks in Santiago. Jen made a stray canine friend who followed us for over a mile. Animals just can't resist her. For awhile there were actually two dogs following us, but one go distracted after not too long. Check out Jen's blog post for a video of her friend frolicking in the sprinklers. 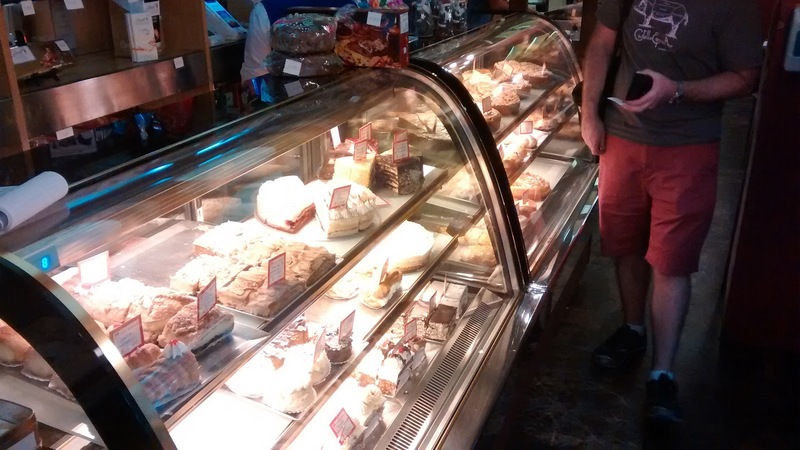 Last week I found a pretty nice bakery and brought Jen some treats for dessert. Luckily they weren't very busy either time I went because communication was rather slow, but at least I got the job done. Now that I have learned the pattern for buying baked goods it is much easier. You generally tell someone what you want, which they write down. Then they hand you the slip of paper with your order on it and you go pay for it. While you're paying they get the item out of the case and package it up. The cashier gives you a receipt, which you take back to the counter, at which point you receive your items. Very complicated, but that is just how Chile operates, lots of bureaucracy. Speaking of bureaucracy, Will and I went to the SII (some kind of government entity related to work and taxes) to finish the long process required before we can pay ourselves. 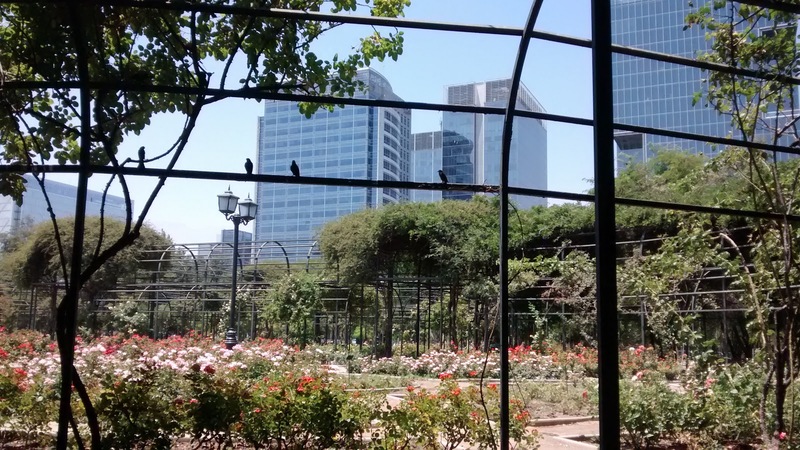 As Chilean bureaucracy goes, it was really quite pleasant. 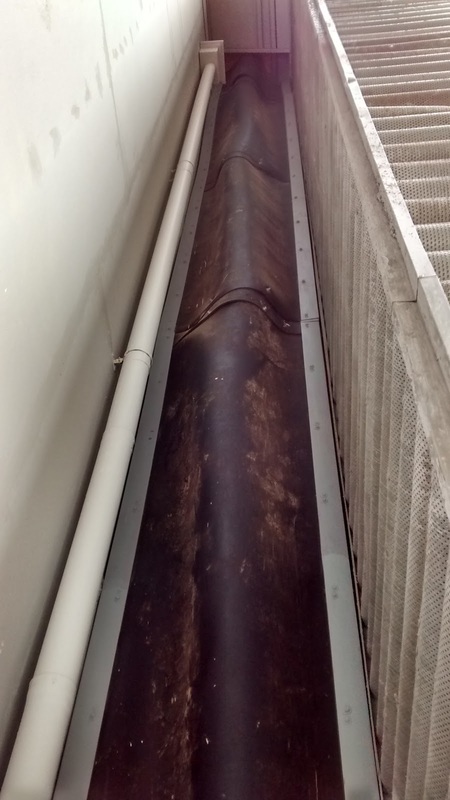 However, I noticed as we were leaving that I had a horrible stomach ache, the kind caused by stress. I think that if I had to stay here for too long I would end up with ulcers. Paperwork is not my friend.